A converted 19th-century country schoolhouse turned B&B offers unique accommodations in a town bursting with quaint inns. Large guest rooms—some big enough for two queen beds—maintain their schoolhouse roots with blackboards still hanging on their walls and extra large windows. The large rooms are decorated in an homage to French country style and have 13-foot embossed ceilings, though the decor in some rooms feels a bit mismatched with Amish-style furniture mixed with more elaborate antique pieces. Nearly all of the woodwork and floorings are original. Though striking to look at, this does mean you can hear footsteps above you if you are staying in lower rooms. There is one ground floor room equipped for disabled guests, though it lacks some of the charms of the other eight rooms. Some rooms have a Jacuzzi, while all have modern amenities in the spacious, if a little dated, bathrooms. 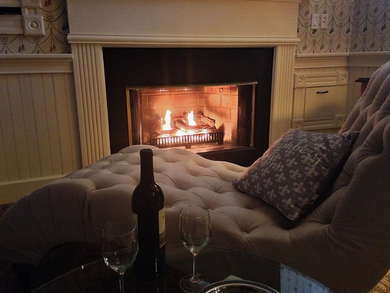 The inn takes advantage of all its space for guest rooms and there is no grand parlor or communal lobby area. A variety of in-room massages are available ranging from Swedish to hot stones. Book in advance. There's no breakfast room or dining area so breakfast is served daily in your room with a lovely tray of items you can order ahead. There's no bar at the inn, but several are within a short drive. A car is needed to see the towns in the Berkshires, but several bars and restaurants are within walking distance or a very short drive. Salmon Run Fish House (4-minute walk) is popular for surf and turf standbys like steak or lobster rolls in a casual setting. Equally close by, Starving Artist Creperie (4-minute walk) offers a menu of coffee shop favorites, crepes, baked good and light lunch fare. For casual pub fare like wood-fired pizza and burgers, dine at the restored Victorian that is 51 Park (8-minute walk). You'll also find a long list of brews. While there aren't many upscale bars and pubs in Lee, head a few minutes away to Lenox for more lively options. The trendy Alta wine bar and restaurant (8-minute drive) is perfect for a glass of wine or Mediterranean dinner. The casual Old Heritage Tavern (8-minute drive) pleases with pints of beer and pub grub like burgers, chowder, and pub fries. During summer months, especially after a Tanglewood concert, the lobby of the Gateways Inn (7-minute drive) buzzes with live jazz. There's a long list of beer and wine, as well as the Berkshires largest selection of Whiskey. The inn gets an A+ for historical whimsy and gracious hosts. While not a modern mecca (the Wi-Fi is slow), how often do you get to read and leave notes on original 150-year-old blackboards used by New England students?